The hype was big, much like the plane itself: The 747 was a behemoth, capable of ferrying over 400 people in its cabin. When it taxied, the cockpit loomed 35 feet above the ground. 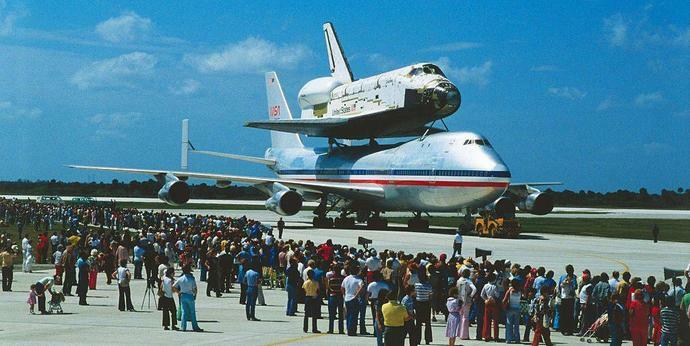 The press labeled it the "Queen of the Skies" and the world's first "Jumbo Jet." As John F. Pearson wrote in Popular Mechanics in 1969: "The craft is so big and solid-looking that you wonder how it can be supported by anything as insubstantial as air." But despite its history and legend, the 747 has been almost entirely phased out from the current lineups of major airlines, replaced by a demand for smaller, fuel-efficient aircraft like Boeing's Dreamliner and 737 MAX. It now faces the increasingly serious possibility of extinction, as it reinvents itself as a cargo plane fueled by the constant demand of online deliveries. Boeing has delivered over 1,500 747s over the course of its existence, helping the aircraft serve some 5.9 billion customers, or 80 percent of the world's population, according to the company. But orders for the aircraft have waned dramatically in recent years, with carriers placing an emphasis on modern planes that can make longer journeys at a slimmer cost. "Big four engine planes operating on largely older technology isn't an aircraft airlines will generally be relying on for the future," airline industry analyst Gary Leff tells Popular Mechanics. Boeing admitted that the 747's death knells were nearing with its 20 year forecast, released in 2017. Demand for hulking four-engine aircrafts like the 747 isn't what it used to be, noted Randy Tinseth, Boeing vice president of marketing. "There will just be a handful moving forward," he told CNN. "Things we do for VIPs, things we do for the president, military operations, but we don't see a significant demand" for commercial 747s. It isn't only Boeing feeling the effects of a thinning demand for giant planes. The Airbus A380, seen as the even more hulking European counterpart to the 747, might soon meet its demise, with the company also grappling with lackluster demand. "The Airbus A380 is a great consumer plane, even bigger than the 747, but has truly struggled in the marketplace," says Leff. "The smaller Boeing 787 and Airbus A350 family- which can fly long distances and are much cheaper to operate-have thrived in comparison." Boeing's delivery numbers, on the other hand, are generally sunny when it comes to just about every other plane in its fleet. Last year, the company delivered a total of 806 planes, belying the heavy demand for its 737 MAX line. "We saw strong sales for every one of our twin-aisle airplanes," Ihssane Mounir, a senior vice president at Boeing, said in a statement. On the contrary, only 18 orders were placed for the 747 last year. "Newer aircraft are more fuel efficient," Says Leff, who indicates that a future of non-stop flights is likely subsume the stopover routes of yore..
And while you might never get the chance to fly in one again, the 747 is likely to live on in the public's eye for years going forward: Boeing is set to deliver two repurposed 747-8 aircraft by 2024, to be used by the president as Air Force One.